When you can measure what you are speaking about, and express it in numbers, you know something about it; but when you cannot measure it, your knowledge is of a meagre and unsatisfactory kind: it may be the beginning of knowledge, but you have scarcely, in your thoughts, advanced to the stage of science. In this post, I’ll talk about what happens when you take a mass of biological data and try to turn it into a single number, intended to measure biodiversity. There have been more than 50 years of debate about how to measure diversity. While the idea of putting a number on biological diversity goes back to the 1940s at least, the debate really seems to have got going in the wake of pioneering work by the great ecologist Robert Whittaker in the 1960s. • S. H. Hurlbert, The nonconcept of species diversity: A critique and alternative parameters. Ecology 52:577–586, 1971. Species richness is simply the number of species in the community concerned. The Shannon entropy is , where our community consists of species in proportions . Which quantity should we call “diversity”? Do all these quantities really measure the same kind of thing? If community A has greater than species richness than community B, but lower Shannon entropy, what does it mean? Which quantities deserve to be called diversity? Which quantities are we capable of measuring experimentally? The statistical problem of designing appropriate estimators becomes relevant only after the measure to be estimated is accepted to be meaningful. The problems involved in quantifying diversity are of three types: practical, statistical and conceptual. I’ll say a little about the first two, and rather more about the third. Practical Suppose that you’re doing a survey of the vertebrates in a forest. Perhaps one important species is brightly coloured and noisy, while another is silent, shy, and well-camouflaged. How do you prevent the first from being recorded disproportionately? Or suppose that you’re carrying out a survey, with multiple people doing the fieldwork. Different people have a tendency to spot different things: for example, one person might be short-sighted and another long-sighted. How do you ensure that this doesn’t affect your results? Statistical Imagine that you want to know how many distinct species of insect live in a particular area — the “species richness”, in the terminology introduced above. You go out collecting, and you come back with 100 specimens representing 10 species. But your survey might have missed some species altogether, so you go out and get a bigger sample. This time, you get 200 specimens representing 15 species. Does this help you discover how many species there really are? Logically, not at all. The only certainty is that there are at least 15 species. Maybe there are thousands of species, but almost all of them are extremely rare. Or maybe there are really only 15. Unless you collect all the insects, you’ll never know for sure exactly how many species there are. However, it may be that you can make reasonable assumptions about the frequency distribution of the species. People sometimes do exactly this, to try to overcome the difficulty of estimating species richness. Conceptual This is what I really want to talk about. I mentioned earlier that different people mean different things by “diversity”. Here’s an example. It has only three species, but they’re evenly balanced. Which community is the more diverse? It’s a matter of opinion. Mostly in the press, and in many scholarly articles too, “biodiversity” is used as a synonym for “species richness”. On this count, the first community is more diverse. But if you’re more concerned with the healthy functioning of the whole community, the presence of rare species might not be particularly important: it’s balance that matters, and the second community has more of that. Different people using the word “diversity” attach different amounts of significance to rare species. There’s a spectrum of points of view, ranging from those who give rare species the same weight as common ones (as in the definition of species richness) to those who are only interested in the most common species of all. Every point on this spectrum of viewpoints is reasonable. None should have a monopoly on the word “diversity”. • Tom Leinster, Christina A. Cobbold, Measuring diversity: the importance of species similarity, Ecology, in press (doi:10.1890/10-2402.1). But that’s not actually our main point. As the title suggests, the real purpose of our paper is to show how to measure diversity in a way that reflects the varying differences between species. I’ll explain. Most of the existing approaches to measuring biodiversity go like this. We have a “community” of organisms — the fish in a lake, the fungi in a forest, or the bacteria on your skin. This community is divided into groups, conventionally called species, though they needn’t be species in the ordinary sense. We assume that we know the relative abundances, or relative frequencies, of the species. Write them as . Thus, is the proportion of the total population that belongs to the th species, where “proportion” is measured in any way you think sensible (number of individuals, total mass, etc). This model is common but crude. It can’t detect the difference between a community of six dramatically different species and a community consisting of six species of barnacle. So, Christina and I use a refined model, as follows. We assume that we also have a measure of the similarity between each pair of species. This is a real number between 0 and 1, with 0 indicating that the species are as dissimilar as could be, and 1 indicating that they’re identical. Writing the similarity between the th and th species as , this gives an matrix . Our only assumption on is that its diagonal entries are all 1: every species is identical to itself. There are many ways of measuring inter-species similarity. Probably the most familiar approach is genetic, as in “you share 98% of your DNA with a chimpanzee”. But there are many other possibilities: functional, phylogenetic, morphological, taxonomic, …. Diversity is a measure of the variety of life; having to choose a measure of similarity forces you to get clear exactly what you mean by “variety”. is what we call the diversity of order of the community. Here is a parameter between and , which you get to choose. Different values of represent different points on the spectrum of viewpoints described above. Small values of give high importance to rare species; large values of give high importance to common species. is shorthand for the relative abundances , and is the matrix of similarities. If you want to know the value at , or any of the other mathematical details, you can read this post at the n-Category Café, or of course our paper. In both places, you’ll also find an explanation of what motivates this formula. What’s more, you’ll see that many existing measures of diversity are special cases of ours, obtained by taking particular values for and/or . But I won’t talk about any of that here. Instead, I’ll tell you how taking species similarity into account can radically alter the assessment of diversity. • P. J. DeVries, D. Murray, R. Lande, Species diversity in vertical, horizontal and temporal dimensions of a fruit-feeding butterfly community in an Ecuadorian rainforest. Biological Journal of the Linnean Society 62:343–364, 1997. 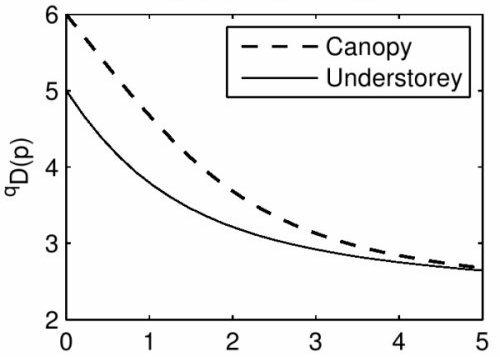 Which is more diverse: canopy or understorey? We’ve already seen that the answer is going to depend on what exactly we mean by “diverse”. First let’s answer the question under the (crude!) assumption that different species have nothing whatsoever in common. This means taking our similarity matrix to be the identity matrix: if then (totally dissimilar), and if then (totally identical). Conclusion: from all viewpoints, the butterfly population in the canopy is at least as diverse as that in the understorey. Now let’s do it again, but this time taking account of the varying similarities between species of butterflies. We don’t have much to go on: how do we know whether Prepona laertes is very similar to, or very different from, Archaeoprepona demophon? With only the data above, we don’t. So what can we do? the similarity is 0 if they are not even in the same genus. This is still crude, but in the absence of further information, it’s about the best we can do. And it’s better than the first approach, where we ignored the taxonomy entirely. Throwing away biologically relevant information is unlikely to lead to a better assessment of diversity. This is more interesting! 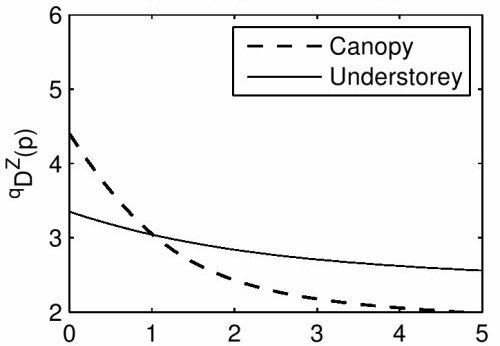 For , the understorey looks more diverse than the canopy — the opposite conclusion to our first approach. It’s not hard to see why. Look again at the table of abundances, but paying attention to the genera of the butterflies. In the canopy, nearly three-quarters of the butterflies are of genus Memphis. So when we take into account the fact that species in the same genus tend to be somewhat similar, the canopy looks much less diverse than it did before. In the understorey, however, the species are spread more evenly between genera, so taking similarity into account leaves its diversity relatively unchanged. Taking account of species similarity opens up a world of uncertainty. How should we measure similarity? There are as many possibilities as there are quantifiable characteristics of living organisms. It’s much more reassuring to stay in the black-and-white world where distinct species are always assigned a similarity of 0, no matter how similar they might actually be. (This is, effectively, what most existing measures do.) But that’s just hiding from reality. Maybe you disagree! If so, try the the Discussion section of our paper, where we lay out our arguments in more detail. Or let me know by leaving a comment. This entry was posted on Monday, November 7th, 2011 at 1:07 pm and is filed under biodiversity, biology, mathematics. You can follow any responses to this entry through the RSS 2.0 feed. You can leave a response, or trackback from your own site. Interesting. Do you have a sense of how to measure diversities of ecosystems that take into account interactions between species? It is not unusual to read that this ecosystem is “simple” and this one is “complex.” Is there a way to quantify this? For some reason I have a feeling that simplicial sets should come in. Interactions are the difference (or part of the difference) between diversity and complexity. That’s one of the problems for complexity-stability research in ecology. Theoretical work tends to look at complexity, but empirical work focuses on diversity because it’s much more tractable. Now I’m off to look up “simplicial set”. • Systems ecology, Azimuth Library. (There should be arrows on these edges.) 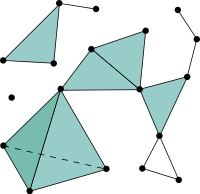 If all the triangles and higher-dimensional simplexes are ‘degenerate’ (that is squashed down so you can’t see them), a simplicial set is just a directed graph. One way to build a more interesting simplicial set is to take a bunch of species (say), use those as the vertices, and throw in a simplex with vertices (a,b,c,d,…) whenever all the species corresponding to those vertices are related (or interact) in some specified way. This only works if whenever a collection of species counts as related, all its sub-collections also count as related. Simplicial sets built this way show up in a lot of applications. I’m also much more interested in ecological dynamics than static diversity. The place to start is with simple Lotka-Volterra models. They’re still used in some research and any population ecology or theoretical ecology book will have a lot to say about them. • Richard J. William, Homage to Yodzis and Innes 1992: scaling up feeding-based population dynamics to complex ecological networks. 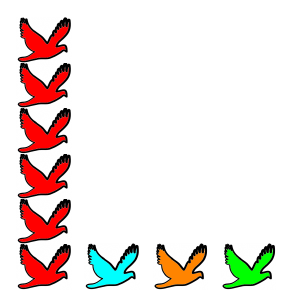 Actually, much of the material at foodwebs.org is worth reading — the PeaceLab folks do a lot of very good work on food webs. • James Justus, Complexity, diversity and stability. Yes, Justus is in a philosophy department, but most of that chapter is just a good explanation of key ecological concepts — I’d happily assign it to grad students. I’m also much more interested in ecological dynamics than static diversity. There’s obviously much more richness to be found in a dynamic situation than a merely static one. Nevertheless, the relatively simple problem of quantifying the diversity of a single static community shouldn’t be underestimated: it’s been tripping people up for decades. Justus, in the book chapter you link to, cites a 2005 paper of Ricotta called “Through the jungle of biological diversity”. The thrust of that paper, as I understood it, is that there’s a bewildering mess of diversity measures and it’s near-impossible to hack your way through them. This seems to have been a common view at the time, and maybe in some circles it still is. But since 2006 (possibly before Justus wrote that chapter), things have become much clearer. 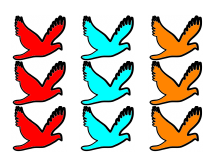 The turning point was a paper of Lou Jost arguing that all diversity measures should be effective numbers, meaning that the diversity value assigned to a community of species in equal proportions is . There are several excellent reasons for this; see the paper for some of them. Actually, MacArthur and Whittaker both argued long ago that when it comes to measuring diversity, the exponential of Shannon entropy is more natural than Shannon entropy itself. Jost wasn’t the first person to argue for the use of effective numbers, but either he argued more convincingly or the time was ripe, because that view seems to have gone from controversial to commonplace extremely quickly. See for example the editorial introduction by Ellison to the special section on diversity in Vol. 91 of Ecology. Interactions are the difference (or part of the difference) between diversity and complexity. I haven’t thought much about complexity and don’t have well-developed opinions on how the word should be used. But I very much approve of being precise about the meanings of words such as “complexity” and “diversity”. Diversity indices like the Shannon entropy (“Shannon-Wiener index”) and the Gini-Simpson index are not themselves diversities. They are just indices of diversity, in the same way that the diameter of a sphere is an index of its volume but is not itself the volume. Using the diameter in place of the volume in engineering equations would give dangerously misleading results. Things would be even worse if some engineers liked to use surface area, and if others liked to use circumference in place of volume. Imagine the chaos if they called all of these things by the same word and used them interchangeably in engineering equations that required volume. This is what biologists are doing with diversity indices. Eugene: that’s a good question. I’m not sure that the word “diversity” should reflect interactions between species. But the measures described above can be used in a sensible way to measure the amount of interaction between species. Let’s take the simplest possible scenario: given a pair or species, either they’re deemed to interact, or they’re not. So we have an (unoriented) graph whose vertices are the species, and with an edge between species and if and only if those two species interact. This is, equivalently, a symmetric square matrix of 0s and 1s. Call it . As usual, I’ll write for the proportions in which the species are present. Is the diversity in any way interesting? Yes, as it turns out. Take your favourite value of , then choose the value of that maximizes the diversity of order . That maximum diversity value turns out to be equal to the largest number of non-interacting species. In other words, it’s the largest such that there exist species none of which interact with any of the others. This is true independently of . I don’t know of any connection with simplicial sets. Maybe they’d come in if you were thinking of multiple species interacting at once, rather than just interacting in pairs. So the graph I just described would turn into a simplicial complex. I have no idea what happens then. Tom: First, an apology — I am a bit stymied by not knowing how to post links to this blog. http://dx.doi.org/10.1090/S0273-0979-06-01108-6 ). I wanted to know what the groupoids in question were acting on. (the latter paper is the reason why I mentioned simplicial sets). one could try to understand and measure its complexity. The measures of diversity you nicely described seem to capture the diversity of nodes of such graphs. I am wondering if one could get at the diversity of edges or maybe higher dimensional versions of edges. Admittedly this is a bit of a confused comment. But I have to run. Hi, Eugene! I hope you had a nice jog. I am a bit stymied by not knowing how to post links to this blog. &bull; John Baez, <a href = “http://math.ucr.edu/home/baez/renyi.pdf”>Renyi entropy and free energy</a>. • John Baez, Renyi entropy and free energy. But by the way: if you want to link to a specific comment on this blog, just click on the date of that entry, then look up at the little window on your browser that shows URLs, and you’ll see the URL of that comment, which you can use to link to it. For me to understand what Golubitsky et alii have done requires a doze of category theory. Maybe you meant a dose of category theory, but I kind of like this. A pride of lions, an exultation of larks, a doze of category theory. “A doze of category theory” will live in cyberspaces forever. I also don’t know how to put food on my family. In theoretical physics, quantum field theory or statistical mechanics, a technique known as renormalization is often used. The renormalization determines how, for a given theory, evolve the parameters of this theory, from “large” scale to “small” scale. For instance, the scale may be the energy, and the parameters may be the charge or masses of particles. Applied to biodiversity, “small” scale, could mean, for example, genus, and “large” scale could mean species. Of course, a hierarchy can be more elaborate than species / genus, but the idea of scale could be still valid. Then we can study a problem of biodiversity at a specific scale. The result depends on the scale that is used. And maybe, we can relate the biodiversity at one scale to the biodiversity at another scale, and maybe find some kind of similarity with renormalization techniques. I don’t know anything about renormalization in physics, but yes, one can think about varying the “scale” when assessing biodiversity. Suppose we want to quantify the genetic diversity of a bird community. An initial, rough and ready survey records only the various genera and their abundances; similarities between genera are given by an average genetic distance. A second, more detailed survey records the relative abundances of, and genetic distances between, species. In principle, there might even be a third survey recording the genetic distances between individuals. After each of the three surveys we use the abundance and distance data to calculate the diversity, giving values . Using the measures that Christina and I propose, the progression of diversity values reflects exactly the knowledge gained by the successively more refined surveys. For instance, in the unlikely event that every species consisted of genetically identical individuals, we would have . (In our paper, we call this the “identical species” property.) A small amount of intraspecific variation would cause a small difference between and ; a moderate amount would cause a moderate difference; and so on. John, yes, Christina and I do have plans to go further with this. In particular, as you know, we’re planning in particular to go further with it at the conference and research programme in Barcelona next summer. You asked about the “world of uncertainty” that opens up when you try to quantify the similarity between two species. (The diversity measures defined above require choosing a number between 0 and 1 for each pair of species.) So let me say something about that. My overall view is that it’s up to the experts in particular fields should decide what measure of similarity is most meaningful. For example, it’s easy to understand “genetic similarity” in a simplistic sense as “proportion of places where the DNA agrees”: e.g. the similarity between GTTAC and ACTGC would be 0.4, because they agree in 2 out of 5 places. But after a moment’s thought you realize that it’s going to be way more complicated than that. DNA varies from individual to individual, so whose DNA do we use? And portions of the sequence of nucleotides (the letters G, T, A and C) are often repeated – e.g. ACTGC might mutate into ACTTGC – so you don’t really just want to put two DNA molecules next to each other and compare them position by position. So there are subtleties here, and it might be that no way of measuring genetic similarity is clearly superior to all others. The same will probably be true for other, non-genetic, ways of measuring similarity between species. It’s definitely not for us to impose our opinion here. The bottom line is that different notions of similarity between species give rise to different notions of diversity. That’s as it should be. To take a rather artificial example, suppose you’re interested in the animals that live in a certain cave system. Perhaps you’re an expert on animal locomotion, and you’re studying how the animals get around these caves. Some crawl, some swim and some fly. From that point of view, bats and birds would be deemed to be quite similar. But phylogenetically they’re very different: they diverged a long time ago in their evolution. So if the caves largely consisted of flying creatures, an animal locomotion expert might want to view the community as not very diverse, but a phylogeneticist might “disagree”. I put it in quotation marks because these two people don’t really disagree — they’re just measuring different things. All that should be kind of obvious. But it seems there’s a necessity to be clear about it. There’s a lot of discussion at the moment about how the word “diversity” should be used. When machine learning folk look for a similarity measure on strings, they often choose a string kernel, which allows for non-contiguous sequence matching. Thanks, David. I hope you didn’t take me to be suggesting that this problem of comparing nucleotide sequences was unsolved. I know for sure that the people who do these things have their ways. I only wanted to point out that even once you’ve made a broad choice such as “I want my measure of similarity to be genetic”, there are still a bunch of finer choices to be made. Different choices embody different views on what it means for two species to be similar, and therefore lead to different measures of a community’s diversity. It almost seems like diversity is not zero dimensional, but should take into consideration the full curve. Sorry. I didn’t say that quite right. What I meant is maybe diversity should be thought of in terms of the whole curve and not just a single real number. No I didn’t think you were suggesting that. I was recalling the fun we once had with kernels. There’s been lots of work done on phylogenetic tree reconstruction using kernel methods. Yes, absolutely. That’s one of the points we’re keen to make. In fact, it can be shown that in a certain precise sense, the relative abundances can be reconstructed from the curve. So the process of passing from the relative abundance vector to the curve doesn’t lose any information: it’s just repackaging it in a useful way. David: OK, good. Thanks. My colleague Chris Quince in the engineering department works on things like the human microbiome — the enormous community of microorganisms living in and on your body (and apparently outnumbering your actually body cells by 10:1). He’s explained to me that to calculate the diversity of microbial samples, they extract some DNA and use some rather sophisticated algorithms to reconstruct something like a phylogenetic tree. It seems to be quite complex stuff, not necessarily conceptually right, but somehow accepted by that community. Oops: when I wrote that the algorithm was “accepted by that community”, I didn’t mean the community of microbes living in and on your body. I meant that community of researchers. In further response to John’s comment, here’s a question I’ve been thinking about on and off: how should we understand non-symmetric similarity matrices? For a similarity matrix to be symmetric means that the similarity between the th and th species is equal to the similarity between the th and th species. This sounds like an obvious assumption. However, none of the properties of diversity that we prove in our paper turn out to require it. Moreover, there are interesting and useful non-symmetric similarity matrices. For example, in the appendix to our paper, we show that a certain phylogenetic diversity measure (proposed by Chao, Chiu and Jost) can be obtained from ours by sticking in a certain similarity matrix . And this matrix is non-symmetric. In that situation, the lack of symmetry comes from the fact that time is not symmetric. Saying that species is descended from species , is not the same as saying that species is descended from species . Phylogenetic trees have a definite orientation. There’s at least one other way in which non-symmetric similarity matrices arise naturally: disease transmission networks. Suppose we have a group of individuals, each of whom may or may not be infected with a certain disease. For each pair of individuals, we can guess the probability of the th individual passing the disease to the th individual within a one-year period. Since our “units” are not species but individuals, we should take our (which would ordinarily specify the proportions in which the species are present) to be . The “diversity” measures something like the robustness of the group. A high value means that it takes a long time for a disease to spread. There is the idea that diverse populations are less vulnerable to disease, but I’m not actually saying anything about that: I’m just saying what the quantity that we called “diversity” measures. However, it’s entirely possible that the similarity matrix is non-symmetric. For example, some sexually transmitted infections are more easily passed from men to women. Or the individuals might be of different species, etc. So what we have here is a useful but non-symmetric similarity matrix. Very nice article, also the series at the n-café (which is probably the only one I understand there). Understanding diversity is hugely important giving the rate at which we are destroying it (at least, for many of it’s possible meanings). The following is primarily a problem for ecologists rather than mathematicians, but which connection are there between ecosystem functioning (and the services it may provide) and the diversity it contains? I’m perfectly aware that if I want a documented answer (or some collection of them) I should read into the extensive research over this particular question. (And indeed tomorrow I’ll borrow the book “Biodiversity and ecosystem functioning” from my faculty’s library). But maybe some of the writers or readers of this blog have a different background and so novel perspectives particularly to the way biodiversity is proposed to be measured here (for example, with diversity profiles). I have my own intuitions on the subject but wouldn’t like yet to influence others. People […] tend to use numbers where more sophisticated constructs might be better. Well, looking for those appropriate constructs are my favourite mathematical activity. One I’ve learnt from your posts is the n-cube graph as, for example, a model of the configuration space for an ecological succession. I know that the question you ask — the connection between diversity and ecosystem functioning — has been extensively considered, but I know very little about it. Just about the only thing I think I know is that it’s the high values of that are generally considered to be most important for the functioning of whole ecosystems. The general thought, crudely put, is that common species affect the functioning of an ecosystem more than rare ones. And high values of pay more attention to common species than low values do. In other words, you find the most common species in the community or ecosystem, then calculate the reciprocal of its relative abundance. As Berger and Parker pointed out (in a study of plankton sediment on the sea floor), it’s a measure of dominance. A high Berger–Parker index means that the most common species isn’t very common: no single species is too dominant. A low value means that some particular species makes up a large proportion of the population. For example, a Berger–Parker index of 1.25 = 5/4 means that 4/5 of your community comes from one particular species. The Berger–Parker index is a special case of our measures: it’s , where is the identity matrix. (The similarity matrix is because we’re using this naive model.) So it’s an effective number. This means that it’s measured in units of species: a Berger–Parker index of 1.25 means that your community “effectively contains 1.25 species”. That’s an important point. Reducing a distribution to a single number can be useful, but it’s always risky. My guess is that you meant to attach this comment as a reply to this one, where Eric was suggesting that we use the diversities for all instead of just one. This is mathematically very similar to using the whole partition function to characterize a physical system, instead of its value at a single temperature. The main advantage of using just one real number to measure how good things are, instead of something more complicated, is that real numbers are linearly ordered: either or or . So, if we’re trying to make decisions about what’s ‘best’, measuring ‘goodness’ by a single real number lets us decide this unambiguously. However, there’s almost always a huge price: if we don’t make the best decision about how to measure goodness by single real number, what’s ‘best’ won’t really be best! In particular—and this may be more controversial—I think that the idea in economics of assigning a numerical value to happiness (or more precisely ‘utility’) is misguided, because in real life the conditions of the von Neumann–Morgenstern utility theorem rarely hold. People don’t actually make decisions by comparing all possible options and ranking them! Often the choice I would have made, if I’d thought of it, is one I never considered. But the idea of utility offers a nice justification for the existence of money, and money is convenient, so the idea of utility will be with us for a long time. Yep. :-) The system wouldn’t let me reply directly to Eric’s post. It may be useful to note that biologists will often reduce their data to a single number (an index, a mean, whatever) without any thought about what is being lost. If the folks commenting on this blog need to be reminded of the usefulness of single numbers, it’s the opposite for many biologists. The system wouldn’t let me reply directly to Eric’s post. Right. The column of text gets a bit more skinny with each successive reply to a reply to a reply… and after 3 levels of reply, it becomes absurdly skinny, so the system doesn’t let you reply directly. In that situation you should go back up to the first reply you can comment on. In fact this what Eric had to do to write the comment you were trying to reply to! You can see this by looking at the comment he was replying to: it has no blue Reply thing under it, unlike the comment you just wrote, or the one here. It may be useful to note that biologists will often reduce their data to a single number (an index, a mean, whatever) without any thought about what is being lost. Indeed. People who don’t like math much tend to use numbers where more sophisticated constructs might be better. These are often the people who think math is about numbers. To increase gender balance, it’s all a matter of getting the right story out about science and engineering to young women, that it’s not about sitting at a desk doing math all day. And how do we improve the gender balance in math? Get the story out that it’s not about sitting a desk doing science and engineering all day? Yes, it annoys me when my algebra students, say, make an error in elementary arithmetic and say “My only problem was the math.”. What’s ironic is that they usually don’t realise how true that is! a community’s diversity index is merely a single descriptive statistic, only one of the many needed to summarize its characteristics and, by itself, not very informative. The belief (or superstition) of some ecologists that a diversity index provides a basis (or talisman) for reaching a full understanding of community structure is totally unfounded. If it is a meta-community then the RAD is spread out by the log of the two ratios.